Unless you are an ostrich, you already know that Hugo is a Martin Scorsese film that won a number of awards at the Academy Awards this year. So you think you know what to expect. After all, he is the man who gave us Taxi Driver and Cape Fear, and, more recently, Shutter Island. What you will get instead is a movie so unlike his previous works that you will wonder if you read the credits correctly. Then, as you immerse yourself in the masterpiece that Hugo has become, you will spot the bespectacled director's trademark touches, and wonder who else could have made this spectacular film. Based on Brian Selznick's novel, The Invention Of Hugo Cabret, the movie is about a young orphan boy named Hugo (Asa Butterfield). After the death of his clockmaker father (Jude Law), his alcoholic Uncle Claude (Ray Winstone), who maintains the clocks at the Gare Montparnasse railway station in Paris, takes him in. Hugo learns all about maintaining time, and Claude disappears, leaving the young boy to carry on his work, without alerting the attention of the station Inspector, Gustave (Sacha Baron Cohen), who believes that children who belong nowhere should be hauled away to the orphanage. Hugo has 3 precious possessions - his father's notebook, the automaton or mechanical man that his father found dumped at the museum, and a pocket watch. The automaton needs to be fixed, and Hugo steals parts from the toymaker's booth, hoping to get the robot working. When Georges (Ben Kingsley), the toymaker, catches Hugo red-handed, the boy is forced to give up some stolen parts, and his notebook. And thus begins Hugo's journey, as he tries to get the notebook back, and ends up meeting Isabelle (Chloe Grace Mortez), the toymaker's god-daughter, who becomes his best friend. Together, they discover buried secrets and forgotten memories, as well as the joys of sharing an adventure and new relationships. 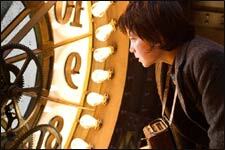 Hugo is essentially a children's movie, and Scorsese is believed to have jumped into the project because his 12-year-old daughter had never seen any of his films. The 2 protagonists in the film are children, and the movie explores an adult world through their eyes. The kids begin to understand pain, disillusionment and other grown-up complications, and, with the selflessness of youth, try to fix things for people who have not always been nice to them. The children have too much going on for them, but are innocent enough to have faith and optimism, as well as headstrong values. 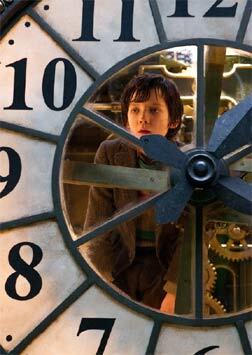 Asa Butterfield is a discovery, with his big blue eyes and melancholic face. He is monotonously depressed, but that adds to the character. Reminds one of Frodo from The Lord of The Rings series - a little weird, maybe creepy, but a harmless person really. Chloe Grace Mortez portrays a slightly more rounded character - a person with love for books and adventure, and who is friendly and lively. She brings in the right balance between an adolescent attaining maturity and a child still dazzled by magic. Ben Kinglsey is apt for his role. His body language changes from that of a beaten man to that of a resurrected hero, and he brings in layers of pain and pride. His frustration at being forgotten becomes his pain, and, consequentially, his burden. Traces of his most famous role, in Gandhi, are evident. Sacha Baron Cohen can be a serious - albeit comedic - actor, too, as is obvious by his portrayal of the bitter, not-so-nice cop. Christopher Lee leaves an impact with his small role, as does Emily Mortimer. The music is almost fantastical, and the background score, accompanied by clockwork whirrs and machine creaks, adds to the little world that is created at the station. The story is set in 1931, and the less said about the visuals, the more your curiosity will be satiated. Imagine a period film, in 3D, shot mostly in an environment as colourful as a railway station, and also the insides of a clock tower - you get the picture. The cinematographer and visual effects team have outdone themselves. Hugo is a must-watch, and not just because of its Academy Awards. It is an escape into childhood, into a world where there is always hope, and where there are happy endings. Despite its length, it will blow your mind, and instil in you new respect for the wonder that is Martin Scorsese. Be the first to comment on Hugo (3D)! Just use the simple form below. fullhyd.com has 700,000+ monthly visits. Tell Hyderabad what you feel about Hugo (3D)!